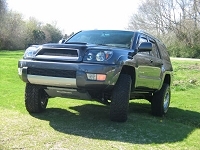 Is the 4Runner fitted with Shrockworks sliders? Our rear crossmember for the 4th generation 4Runners is designed to support the back end of our transmission skid plate, and then attach to our fuel tank skid. This reinforced steel crossmember is no exception, providing sturdy support when you need it most. It acts like a cross brace to the rest of your skid plates.